Telenet and ZTE signed a strategic partnership agreement that deepens the strategic cooperation between the two parties on 5G and Internet of Things (IoT), focusing on joint R&D, testing and business exploration in the field of internet communications and technological innovations towards the future. The Port of Zeebrugge is joining forces with the China Development Bank and launching the ‘China Europe Railway’ with Changjiu Logistics Group. On June 2nd, the Port of Zeebrugge signed a Memorandum of Understanding with China Development Bank and with Changjiu Logistics Group. Mr Joachim Coens, CEO of the Zeebrugge port authority, signed the agreements in Brussels. 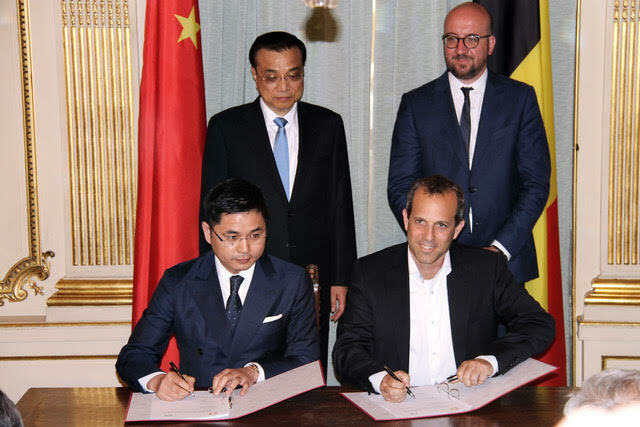 The signing ceremony was witnessed by Chinese Premier Li Keqiang and Belgian Prime Minister Charles Michel. Port of Zeebrugge and China Development Bank intend to combine the market advantage of the Port Authority of Zeebrugge and financial strength of the China Development Bank by building a new strategy partnership. Based on the MoU, China Development Bank will provide financial support to the Chinese export companies who intend to establish their European cargo consolidation center in the Port of Zeebrugge. China Development Bank will also provide financial support to the “Silk Road Platform Zeebrugge” project which has been jointly launched by the Port Authority of Zeebrugge, China COSCO Shipping Corporation and China Minmetals Corporation in October 2016. 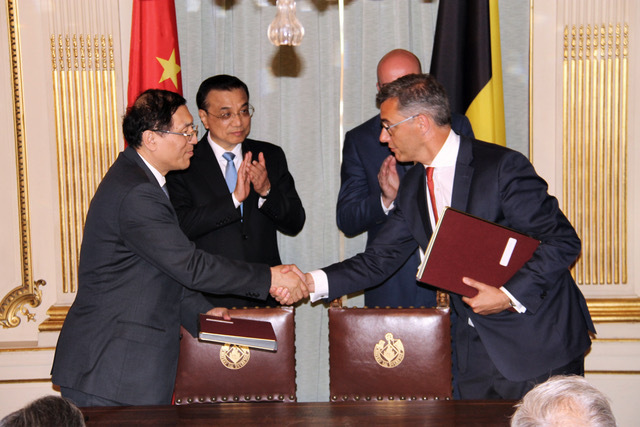 This agreement will promote the trade and cargo flows between China and Europe via Zeebrugge. The port authority also signed an agreement with Changjiu Logistics Group for the launch of the China-Europe Railway “Heilongjiang-Zeebrugge”. The frequency of the train is 4-6 services per week, up to 300 services per year. Each train will be loaded with 225 Volvo cars. The transit time is less than 20 days. 24,000 new Volvo cars with a total value of €600 million will be transported to and distributed from the Port of Zeebrugge on a yearly basis. On 2 June, BusinessEurope and the China Council for the Promotion of International Trade (CCPIT) hosted the 12th EU-China Business Summit in Brussels, Belgium in cooperation with the European Union Chamber of Commerce in China (EUCCC), the EU-China Business Association (EUCBA) and with the support of the Flanders-China Chamber of Commerce. The EUCBA and FCCC were represented at the Summit by Mr Jochum Haakma, Chairman EUCBA; Mr Philippe Van der Donckt, Vice-Chairman EUCBA and FCCC; Mr Bart De Smet, CEO, AGEAS and Vice-Chairman FCCC; Ms Gwenn Sonck, Executive Director EUCBA and FCCC; Mr Philip Eyskens, Senior Vice President Legal, IT and M&A, Bekaert and Board Member FCCC; and Mr Christian Leysen, Executive Chairman Ahlers and Board Member FCCC. This one-day event brought together around 500 business leaders from Europe and China and is the highest level platform for policy discussions between business leaders from both sides. EU Commission President Jean-Claude Juncker and Chinese Premier Li Keqiang each made a keynote address in which they outlined their views on how to address the challenges and seize the opportunities in our economic relationship. China will take steps to make it even more attractive to foreign investors, and administrative procedures will be simplified to guarantee that foreign and domestic investors are treated equally, Li said. China and the EU are continuing to negotiate the China-EU Bilateral Investment Treaty. 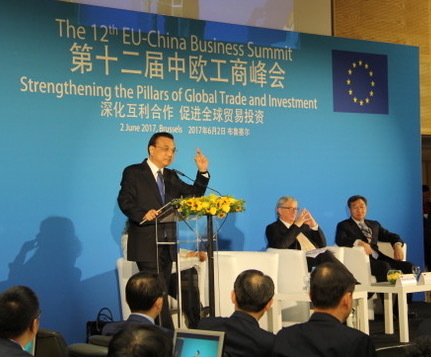 Li Keqiang told the Business Summit that capable Chinese enterprises are being encouraged to invest in Europe. He also defended the benefits of globalization. Free trade leads to the opening of doors, fair competition, and more options for consumers worldwide, the Chinese Premier said. But he added that it is difficult for any two countries to have completely balanced trade at all times, and attempting to make that happen could affect the process of free trade. Countries need to maintain a cool head when discussing how to evaluate free trade and how to implement fair trade. The Premier said China has been upholding the principle of multilateralism and thus living up to the rules of the World Trade Organization (WTO). In his keynote speech, Premier Li said both sides believe they should go with the tide of globalization and work to make globalization fairer and more inclusive. Globalization has brought tremendous benefits to China, the EU and the world, Li said, and it should not be blamed for the negative influence emerging along it. But he cautioned that China and the EU should take action to tackle the problems brought by economic globalization. The current pressing task is to uphold the principles of fairness and free trade and revive the two engines of trade and investment, he added. China always attaches great importance to fairness and sustainability while promoting free trade with the EU, Li said. Under the overall theme of “Strengthening the Pillars of Global Trade and Investment”, CEOs and high level business leaders from European and Chinese companies presented their views on how to move forward in trade and investment; the digital economy; climate and energy; and EU-China connectivity. 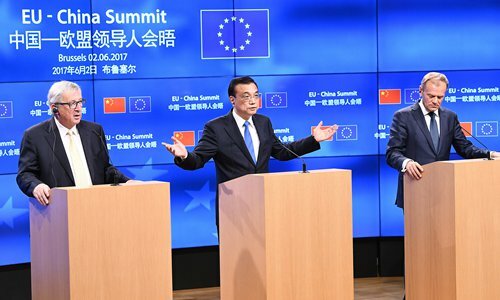 Chinese Premier Li Keqiang co-chaired the 19th China-EU Leaders’ Meeting together with Council President Donald Tusk and European Commission President Jean-Claude Juncker on June 1 and 2. Agreement was reached on climate change. The European Union and China warned U.S. President Donald Trump he was making a major error by withdrawing from the Paris climate pact, but they failed to agree on a formal climate statement because of divisions over trade. Speaking alongside Chinese Premier Li Keqiang, European Council President Donald Tusk said efforts to reduce pollution and combat rising sea levels would now continue without the United States. “We are convinced that the decision by the United States to leave the Paris agreement is a big mistake. The fight against climate change, and all the research, innovation and technological progress it will bring, will continue, with or without the U.S.,” Tusk said. In their meeting, the three leaders committed to cutting back on fossil fuels, developing more green technology, and helping raise funds to help poorer countries cut their emissions. On trade and steel overproduction, differences remained. Premier Li urged the European Union to fulfill the promise made in Article 15 of the protocol on China’s accession to the World Trade Organization (WTO). The EU has still not recognized China’s market-economy status, which should have been granted 15 years after the country joined the WTO on December 11, 2001. President Juncker referred to a World Bank report placing China 78th out of 190 countries in terms of the ease of doing business. “A big economic powerhouse needs to be higher than mid-table,” he said, adding that a planned EU-Chinese investment treaty needed to be completed to ensure reciprocal relations. In reply, Li said China was working hard to promote a trade balance, with Chinese tourism to Europe now far greater than EU tourism in China. Foreign investment opportunities, he said, were far different from when China first opened up. “I do hope you can put things into context. We find the problems, but we are working on them. Our ranking is getting better,” he said. The EU complained to China about steel overcapacity and the export of Chinese products to the EU at dumping prices. China’s annual steel output is almost double the EU’s total production and Western governments say Chinese steel exports have caused a global steel crisis. The leaders witnessed the signing of cooperation documents in fields ranging from energy to intellectual property. “Good afternoon, let me first of all welcome Premier Li in Brussels. It is very good to have you here. Today, we are stepping up our cooperation on climate change with China. Which means that today, China and Europe have demonstrated solidarity with future generations and responsibility for the whole planet. We are convinced that yesterday’s decision by the United States to leave the Paris Agreement is a big mistake, bigger than not ratifying the Kyoto Protocol, because Paris is fairer. But the fight against climate change, and all the research, innovation and technological progress it will bring, will continue, with or without the U.S.